Bletchley CC bags a Rain Cover cricket pitch cover! Milton Keynes village side Bletchley CC has just taken delivery of a brand new Rain Cover cricket pitch cover courtesy or cricket pitch specialist total-play Ltd. The club was drawn from entries in a Facebook competition run by the company to mark the 15th anniversary of its groundbreaking Climate Cover System™. 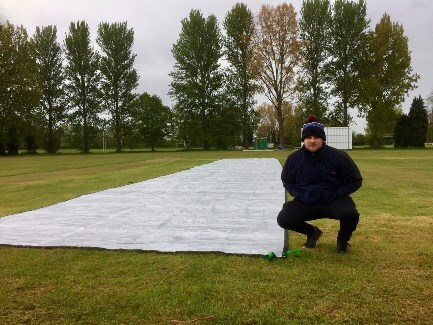 The club’s prize of a flat sheet Rain Cover worth £230 + VAT was delivered to its ground in early May, with Patrick Scholte who posted the winning entry on hand to put the new cricket pitch cover through its paces. The Rain Cover, designed to as an easy to use cricket pitch cover offering quick protection against rain prior to or during play is strong & semi-translucent; engineered to give maximum durability for frequent use. Already a popular choice for clubs following its launch in 2013, the Rain Cover was re-launched this year to a specification that includes an improved material having been sourced offering added UV stability. The covers are constructed from 14×14 HDPE woven yarn with double LDPE lamination, 100% waterproof, and feature webbing reinforced handles, hems & eyelets for added durability. The Rain Cover can be left on for short periods i.e. the night before a game, but should be used as a waterproof cover only and not as a germination cover. The cover should be removed as soon as possible prior to a game starting, to reduce the sweating effect and allow the grass plant to recover before play takes place. A great solution for clubs on a budget, it represents the most cost effective cricket pitch cover currently available through the NatWest CricketForce initiative. The Rain Cover is available exclusively via total-play Ltd’s online store, www.thecricketgroundshop.co.uk and is available in sizes ranging from one to three pitch covers. For more information on the Rain Cover cricket pitch cover and how to claim NatWest CricketForce discount, click here.